Scanner for IIS short file name (8.3) disclosure vulnerability by using the tilde (~) character. 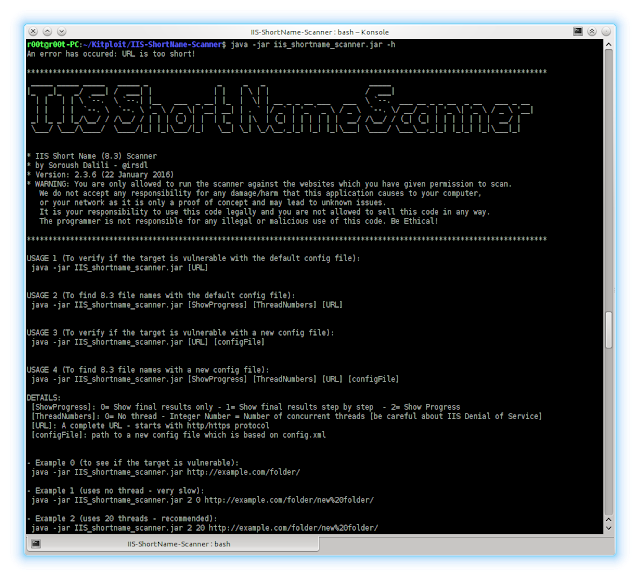 This scanner was moved from https://code.google.com/p/iis-shortname-scanner-poc/ to GitHub for better support. Note 1: Edit config.xml file to change the scanner settings and add additional headers. Note 2: Sometimes it does not work for the first time and you need to try again. Method of sending the request such as GET, POST, OPTIONS, DEBUG, ... is also important. I believe monitoring the requests by using a proxy is the best way of understating this issue and this scanner. Thank you for contacting the Microsoft Security Response Center. We appreciate your bringing this to our attention. Our previous guidance stands: deploy IIS with 8.3 names disabled. Note: The web folder needs to be recreated, as the change to the NtfsDisable8dot3NameCreation registry entry affects only files and directories that are created after the change, so the files that already exist are not affected.